I just recently updated my Apple TVs from Generation 3 to Generation 4. Many of my movies are now not compatible, the format, for the Generation 4 Apple TV and can not be viewed and it says “this content cannot be played because it’s format is not compatible with this device“. And it seems to be a common issue all over the world and questions are asked in Apple’s forums but no details are provided for troubleshooting. Is there something I can do with the movies I already ripped to MP4 for aTV3 from DVDs (just to let you know, I have 2500 movies… so far). A video converting program that is able to do a batch converting for over 2000 movies with less or no quality loss will be perfect. Is there a DVD ripping solution on Windows and macOS that is able to rip my newly purchased DVDs to Apple TV 4 and what setting do I need to have set on that ripper so I will be able to view them on my Generation 4 Apple TV as well as aTV? After a frustrating search only to find no luck for the issue that Apple TV 4 won’t play Apple TV 3 videos, I decided to batch convert my ripped videos for aTV 3 to aTV 4. I don’t want to re-rip DVDs to Apple TV 4 as there is too many of them and most DVD ripping software doesn’t support batch converting, meaning you will have to insert one, rip, reject it and repeat. This is time-consuming. I have come across the memory release issue in HD Video Converter Deluxe while batch converting over 20 videos and the program gets stuck, I find a perfect alternative-Leawo Video Converter and will use it to batch re-convert my 2000 movies for Apple TV 3 to Apple TV 4. I will add all the movies and leave it converting all the days and nights and here’s a quick guide on how to do it! First of all, follow the below link to download, install, and launch Leawo Video Converter. Please note what you download and install will be Leawo Prof. Media, and the Video Converter is only a component of it. Click Add Video or drag the whole videos to the program, choose the profile Apple TV 4 and hit Convert. As there are a lot of videos to convert and I retain the high quality of the videos, it will take very long. I just leave it all day long! 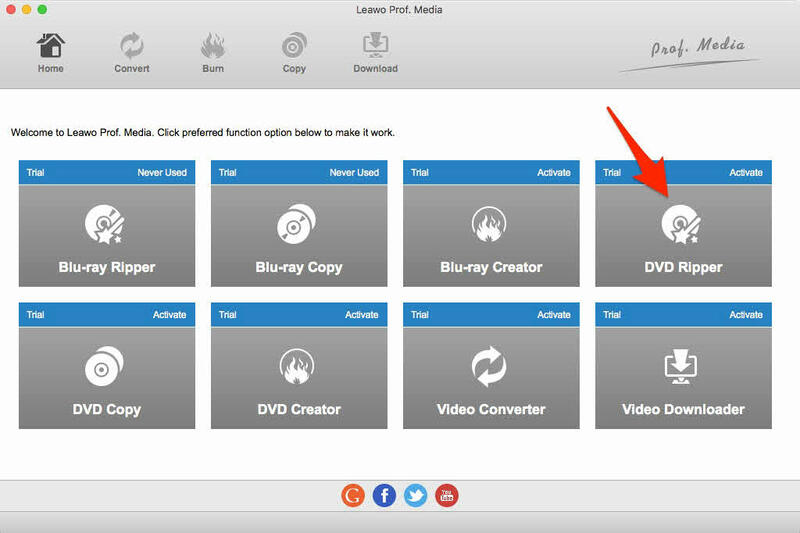 So, how does Leawo Video Converter work for you? I have 25% discount coupon for both Windows and macOS version and you are able to save up to $9.99. For the rest and new purchased DVDs, Leawo Video Converter won’t help even it says to convert VTS VOB to MP4, and I have explained how actually it works. So, for DVDs ripping to Apple TV 4, we need a decent DVD ripper-Leawo DVD Ripper. And below is also a belief guide on how to rip DVDs to Apple TV 4. And the guide applies to other Apple TV models like Apple TV 3 and even the first generation Apple TV. Besides, Leawo DVD Ripper is able to rip DVDs to iPhone X, Galaxy S9/S9 Plus as well. You will like it! 1. Download Leawo DVD Ripper. Please note Leawo combines all programs into one app-Leawo Prof. Media. 2. Launch the program and choose DVD Ripper. 3. Add DVD with the button “Add Blu-ray/DVD” or drag and drop. VIDEO_TS folder and ISO files are supported. You will then be presented to choose the Full, Main or Custom Mode for ripping. Here I recommend Main Mode for movie DVDs and Custom Mode for TV shows. Customer Mode is always available for advanced users who understand DVD structures well. 4. Output Profile. MP4 is the default one. Click it to change it to Apple TV 4. You are free to custom a profile and save it as your own. 5. Rip DVD to Apple TV 4. You just need to hit the Convert button and let it go. Leawo always names the output with Title_x, where x means the title number being selected. You will need to go and rename it yourself. As you may also notice, there is a program called Leawo Video Converter Ultimate and it is also recommended to batch convert aTV 3 videos to aTV 4 and rip DVDs to aTV 4. So, what is the difference between Leawo Video Converter Ultimate and the normal video converter and DVD ripper? Leawo Video Converter Ultimate is combination of Leawo Bluray Ripper, Leawo DVD ripper, Leawo Video Converter, Leawo Blu-ray Copy, Leawo DVD Copy, Leawo Photo Slideshow Maker and online Video Downloader and is able to do all the listed software do. It is also a component of Leawo Prof. Media. I just didn’t list it in the guide just became it was not what I can afford even with the 25% discount to save up to $29.96. And, I think people have different needs with different products, so the guide is separated. Leawo Prof. Media includes all Leawo programs and is able to do the above tasks as well, just more expensive. There is also a 25% discount for you to save up to $52.49. One more thing, as all programs from Leawo are integrated into Leawo Prof. Media, the above guides applies to Leawo Video Converter Ultimate, not to speak of Leawo Prof. Media. ← Are MakeMKV and Handbrake Always the Best Combination to Rip Bluray DVD?